There may be no simple formula for success in public-sector projects, but Public-Sector Project Management delivers the next best thing: a complete set of skill-building strategies that puts success well within your reach. Building on industry standards and best practices as well as almost thirty years of public-sector experience, this definitive sourcebook clearly explains how to manage projects in the public sector and navigate their many challenges. Here is where you'll find all the tools to accomplish your goals for any public-sector project, whether you are overseeing military and security operations, the construction of public infrastructure, improving agency processes, deploying new systems or public programs, or any other public initiative. 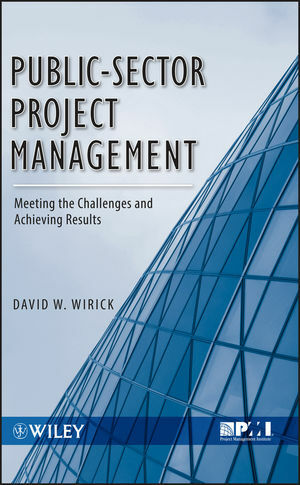 DAVID W. WIRICK, PMP, CMA, is a Visiting Scholar, John Glenn School of Public Affairs, Ohio State University, and is Principal at Kreider-Wirick, LLC.